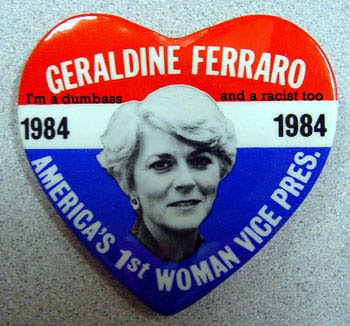 Now that Geraldine Ferraro has quit the Clinton campaign because she's proven herself to be a complete idiot - aka a racist white woman who apparently still isn't over the fact that she lost her bid to be Vice President over 20 years ago - with more time on her hands I'm just assuming we'll be hearing more. "White Only" bathrooms were much cleaner. Martin Luther King Jr. reminds me of someone I saw on Cops. As a white woman, when I call someone a n***** I'm not being racist, I'm just talking about race. It's not that black people aren't smart, their brains are just smaller. How do I make sure that the noose doesn't come undone? Shutter: Maybe a decent remake?